Sometimes that’s all it takes to push an agenda through, fear. The backdrop to all of this, or the 800 pound gorilla in the room is Cuomo’s past. As Attorney General, the indictments he obtained against fellow former allies. Notable Alan Hevesi, consultant Hank Morris and Liberal Party Leader Ray Harding. Fear can be a powerful persuader. But wait a minute, we have been down this road before. Albany lawmakers also started out the same way with Gov. Elliot Spitzer, and we know how that one ended. Quotes like “Elliot doesn’t play well with others,” and ultimately Spitzer was gone. So was reform, and Albany Lawmakers remained well… the permanent government. The jury is out on this one, but on the budget, the message has been sent, and the message has been received, that is Cuomo is not playing. Just look at what he said during a speech in suburban Buffalo Friday, comparing legislative leaders, their alleged concept of budgeting money to that of his teenage daughters, Cara, Mariah and Michaela. 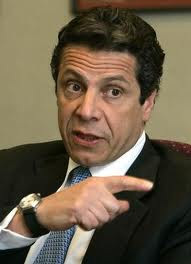 "You can't spend more money than you make," Cuomo told a crowd in Amherst. "There are only two groups of people who don't understand this. No. 1 is the leadership of the New York state Legislature. "No. 2 are my daughters," he said to laughter. "The good news is my daughters are coming around." In selling his tough budget, Cuomo is also pushing to make sure certain practices come to an end like Albany's longstanding practice of "current services" budgeting, or using permanent law to ensure that predetermined, 13 percent increases in spending on government programs continue with little regard for inflation or performance. The tough sell for Cuomo will be in the areas of Education and Medicaid. Both are popular with voters and both areas have powerful lobby efforts. "If they think they're going to give me a budget that says there's going to be a 13 percent increase in Medicaid and education next year, tell them don't bother," Cuomo said. "Because it will go right in the wastebasket." Next move belong to you Assembly Speaker Sheldon Silver and Senate Majority Leader Skelos. Cuomo has learned from Spitzer’s mistakes. Inviting lawmakers to the Governor’s Mansion, as he did will build a reserve. Also, Cuomo also seemed open to reviewing NYC Mayor Michal Bloomberg's push to scrap a law that requires the last teachers hired be the first ones fired during layoffs. The stakes are high for Mr. Cuomo. Not only does the final budget has to contain his cuts, but as a first time governor, he must deliver on his promise of an on-time budget. Will Silver and Skelos challenge him in this regard. Highly unlikely, knowing that would be a declaration of war, but who knows. Albany is always Albany.